lt;stronggt;UNGPR350lt;/stronggt;lt;BR/gt;Pro Stainless Steel Window Squeegees 14quot;lt;BR/gt;Lighter weight yet stronger than brass. Cleans any smooth, flat surface. Fast-lock rubber grip handle, channel, and rubber blade. Blade Material: Rubber Blade Width: 14amp;quot; Handle Material: Stainless Steel.lt;BR/gt;lt;BR/gt;lt;stronggt;UNGED900lt;/stronggt;lt;BR/gt;Pro Stainless Steel Window Squeegees 14quot;lt;BR/gt;Anodized, extruded drawn aluminum pole with nylon locking collar. Snap-in threaded locking cone makes it easy to add and remove tools, even when wet. Accepts tools with tapered or threaded sockets. Ergonomically designed nylon handle grip for comfort. Sectioned for convenient carrying and storage. 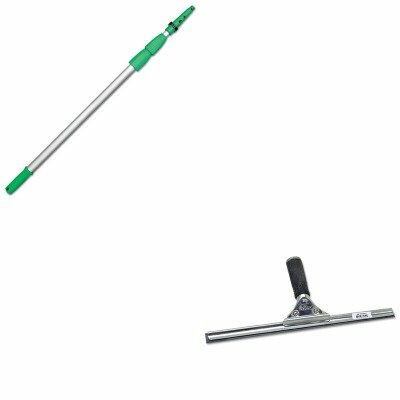 Handle Material: Anodized Aluminum Length: 30 ft.
Unger Professional Stainless Steel Heavy-Duty Squeegee, 8"
EEFUN 7 in 1 Installation Tool Kit for Car Window Wrapping Tint Vinyl with Many Size Squeegee and Silicone Rubber Squeegee.